We love the Easter holiday festival celebrating the resurrection of Jesus. Let these Easter Movies on Netflix inspire you to get into the holiday spirit. Easter Sunday or Resurrection Sunday is a festival and holiday celebrating the resurrection of Jesus from the dead, described in the New Testament as having occurred on the third day of his burial after his crucifixion by the Romans at Calvary c. 30 AD. These movies include everything from drama, kids cartoons, action-adventure, historical events to true stories. These are great selections to add to your Netflix list. These Easter coupons for kids are super cute! What better way to celebrate Easter weekend after that Easter egg hunt than by binge-watching these religious Easter movies on Netflix? If you’re looking for Easter movies on Netflix, be sure to check out Pure Flix, where you can watch Family Friendly Movies and TV Shows Online. Wholesome movies and entertainment to feel good about. Start a free month today. Films like Rise of the Guardians, which tells a story about Guardians Santa Claus, the Tooth Fairy, the Easter Bunny, and the Sandman. 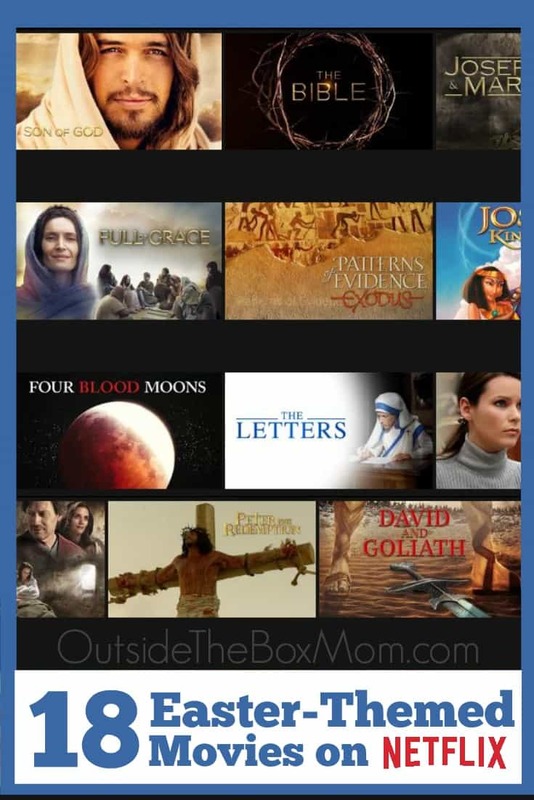 If you liked this list of Easter movies on Netflix, check out Pure Flix, where you can watch Family Friendly Movies and TV Shows Online. Wholesome movies and entertainment to feel good about. Start a free month today. Looking for family activities for Easter? My friend Cerys from Rainy Day Mum has some Simple and Fun Ideas for Celebrating Easter as a Family.